If your utility bills seem extraordinarily high, or you can’t seem to get warm (or cool) despite constantly adjusting the thermostat, consider having a home energy audit performed. A home energy audit will give you information about your home’s energy performance. This simple evaluation, done by a professional, can help you make the decision to upgrade to a more efficient heating and air conditioning system, such as a ductless heat pump, or just manage the causes of energy loss. Professional home energy auditors may use a blower door test, thermography, or a combination of both to determine the sources of your home or building’s air leaks, thus energy loss. And, an audit can take less than half a day. While adequate air exchange in a building is essential for health and safety, many older buildings have a far higher rate of air loss than is recommended. Excessive air leaks can contribute to increased energy consumption, moisture condensation problems and drafts. In fact, air leaks in buildings can account for up to 50% of the total energy consumption. Loss of energy through air leaks can come from chimneys, poorly sealed attics, wall vents, windows and doors, radiant heat, missing, or inadequate insulation. Inefficient HVAC systems, and traditional ductwork also contribute to excessive energy loss (up to 30% of air moving through ductwork is leaked). A blower door test helps ‘exaggerate air leaking through defects in the building shell, making them more detectable when combined with thermal imaging’. 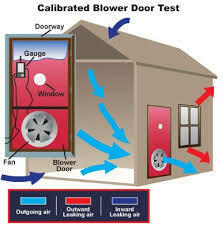 During a Blower Door Test, a powerful fan is mounted in an exterior doorway and air is pulled out of the home or building, lowering the inside air pressure. All interior doors are opened; exterior doors and windows, closed. Then higher outside air pressure begins to filter into the home or building where there are unsealed cracks or openings. A device that produces smoke (a ‘smoke pencil’) is used to determine where the leaks are. If air is moving inside, the smoke column will blow from the direction of the air leak (for example, around the frame of a basement access door). Special gauges are used to quantify the pressure differences and air flow. A blower door test can take up to an hour or more. Energy Auditors may also use Infrared Cameras to give a quick visual image of areas that are losing energy. Thermography measures surface temperatures by using infrared video and still cameras. These cameras see light that is in the heat spectrum. 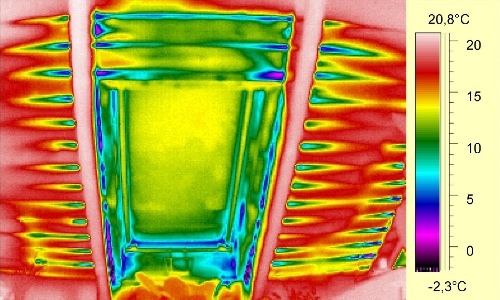 Thermal Images record the temperature variations of the building’s envelope. White identifies warm regions and black shows cooler areas. The resulting images help identify patterns of heat loss that are invisible to the naked eye. It instantly indicates the air leaks within a property and measurement data are easily compiled into a report. And, while reducing excessive air flow contributes to a home or building’s energy loss or consumption, it’s important to have enough air flow to maintain healthy levels of clean, indoor air. A professional home energy auditor will also recommend actions to take to achieve adequate indoor air flow. What does all of this mean? By first knowing your home’s energy consumption sources, you can make any necessary corrections. For most homeowners, adding caulking around windows and plugging cracks or holes with foam insulation is a simple fix. Adding more insulation can be done professionally or as a DIY project. If your heating and cooling system is inefficient, then an audit can help you verify the need to upgrade to a new, more energy-efficient system. Following an energy audit, you can make improvements that could help you save up to 50% on your energy bills, have better ventilation and just be more comfortable in your home or business.